"Managed demolition saves money and resources. Demolition does not touch the Earth lightly. Collaboration with contractors and regulators can develop innovative protocols that decrease impacts and increase cost benefits"
Demolition activity is capable of destroying more than the footprint of the building. 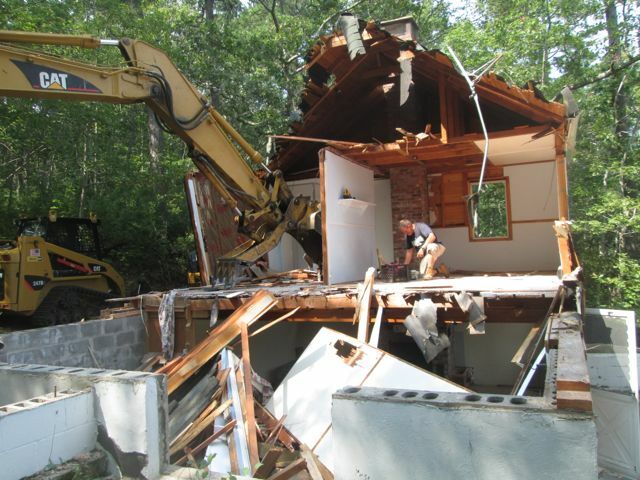 Demolition contractors take pride in their work. We really need their help protecting our natural resources. Demolition doesn't touch the Earth gently. Standard demolition techniques and impacts may be unacceptable in sensitive areas. Deconstruction focuses on integrating techniques that maximize low impact methods and minimize high impact activity. A carefully pre-planned corridor may need to be excavated and hardened to provide access near the structure scheduled for demolition. This minimizes impact through restricted access of mechanized equipment. Native vegetation in the corridor area should be carefully removed and heeled in on site in a designated area for replanting upon completion of deconstruction. Removals should be made with a smooth blade. Soil should be excavated to a depth equal to the branch height of small bushes, usually two feet maximum. This minimizes impact by maintaining a microorganism, micro invertebrate and indigenous vegetation community. Deconstruction also requires an engineered assessment of the structure, to plan for safe removal, as a whole or in components. A contractor needs to sever the foundation or pile connection. Temporary installation of bracing may also be required if recommended or so directed by the engineer. No additional heavy equipment is necessary on the site. Wood bracing can be delivered by crane boom. A crane is then used to remove the structure, as a whole or in engineered components. The crane to a less sensitive part of the same site or to an adjacent site, for demolition or reuse, delivers the structure. This technique limits the amount of time heavy equipment spends on site. Safe Harbor image, showing partial demolition on site. Demolition provides an opportunity to sort materials for repurposing. Demolition Contractor removing plumbing fittings for recycling. The key to successful de-construction is the careful planning and integration of these innovative protocols. De-construction can also significantly reduce environmental impacts by planned re-allocation of de-constructed materials. Significant cost reductions are possible as well, through waste stream reduction. Primary recycling designates materials for re-construction or fuel source. Secondary recycling tub grinds demolition materials as a component for mulching groundcover. Concrete, bricks and asphalt can be crushed for re-use in roadways, walkways and drainage projects. De-construction protocols should specifically describe Techniques for limiting site impacts: Erosion control plan indicating location, design, materials, installation and maintenance; Restoration of grade elevations with compatible particle size and mix; Revegetation plan establishing matching soil horizon profiles; Use of indigenous compost & mulch; Planting and or seeding with indigenous vegetation; Designated areas for minimally impacting access corridor, demolition site, worker parking, equipment storage and demolition materials storage. Cautions: "As Built" plans need to be carefully and professionally reviewed to determine weights and structural integrity of sectional components; Removing household materials (liquids, furniture, appliances, carpets; paints and fuels) minimizes unexpected clean up in sensitive areas; Septic systems need to be precisely located. Removal protocol needs to satisfy Board of Health guidelines.